The Cherries lead through a Dan Gosling goal after Shane Duffy gave the ball away and appeared to jar his knee in the process. Albion have had the majority of the possession but few chances on goal. 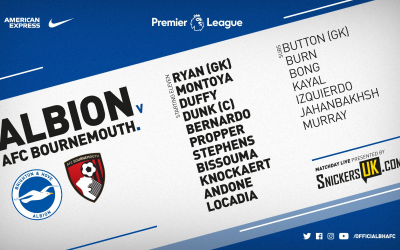 Jurgen Locadia and Florin Andone both start up front for Albion as Glenn Murray drops to the bench. But there is still no place for the fit-again Pascal Gross. Albion are about to start their first FA Cup semi final for just under 36 years. Here’s how they line up. 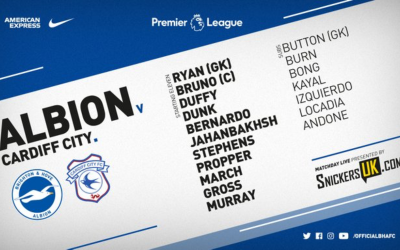 Ryan, Montoya, Duffy, Dunk, Bernardo, Bissouma, Propper, Stephens, Jahanbakhsh, Knockeart, Murray.